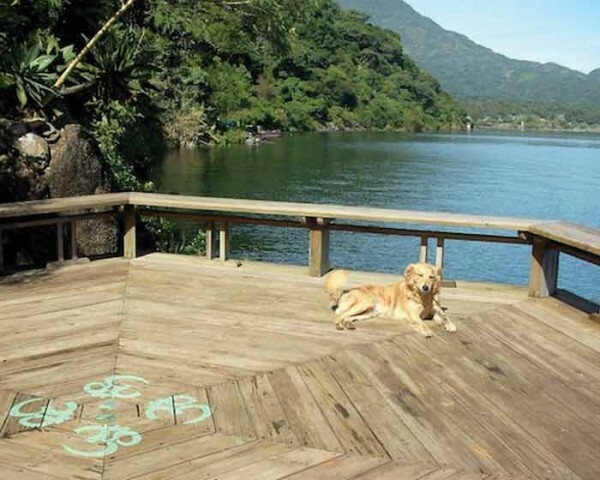 Several years ago, as we arrived at our remote Lake Atitlán sanctuary, we didn’t expect to find a typical-looking street dog sitting near our dock, yet there he was. He was about a year old, in need of a bath and thin! As the boat pulled up our guardian, José, informed us that his name was Oso (bear) and that he did not like people. He kept Oso with him to help guard the property. Gazing at this beautiful lanky dog with a coat that looked like a watercolor of browns and creams, we wrapped our hearts around him and his gentle eyes betrayed the words of José. As we disembarked, Oso was tentative and stepped back. We simply and lovingly went forward, extended our hands, Oso gave us a gentle welcome lick.. We were in love! It was rainy season and Oso did not have a warm place to sleep, as José would not let him in his house at night. It was obvious that Oso knew he belonged to José, yet there was a bond that was forming quickly, and so we purchased dog food that more than filled in the occasional tortilla and a dog toy. Daily Oso would appear at our front door eagerly wagging his tail waiting for his breakfast. Within just a few days we were as close as any dog could be with a human. He would come for affection, enjoy being petted and even allow us to remove the many ticks and other debris from his coat. It was not long after our arrival and meeting Oso that a torrential rain filled the night. It was uncharacteristically heavy, accompanied by lightning and thunder. Oso came to our door for shelter, and we eagerly opened it for him. We had a lovely fire going in our kiva and invited Oso to join us in the living room. At first he was confused yet eagerly accepted the invitation. We gave him a snuggly blanket and together we got on the floor to wipe him dry. Sri reached for the dog toy we’d purchased and within just a few minutes Oso knew exactly how to have fun! It brought tears to our eyes and for many hours that evening Oso learned how to love and be loved unconditionally and to be appreciated for his many talents. It was not long after that José decided Oso should no longer be at the lake, and while we were heartbroken we couldn’t do anything about it. Sadly we said goodbye to Oso when José put him on the boat to take him back to the village. Oso’s departure was felt on so many levels. We missed the morning hello when he came for his food, and we missed his loving personality that had become so responsive to the human touch. Imagine our surprise when just a week later we awoke to the sound of Oso asking for his breakfast! At first we thought we were just hearing things then we looked out our window and there he was. Wet, hungry and obviously tired! As access to TOSA La Laguna is only by boat, this “street dog” had walked over the mountain, a distance of about six miles, and found his way back to us! His route was long and treacherous, and yet Oso had done just that! When José returned from his time off and found Oso with us he agreed to allow him to stay. The rest, as they say, is an ongoing story of love. Congratulations for accepting becoming Oso’s friends! We were honored and lucky to have a street dog as part of our family for 11 years. She was the best friend my youngest daughter could ever have, and she was the most loving pet we had as a family. We still miss her! People need to understand that these dogs are wonderful, because their “pedigree” is called love and loyalty!